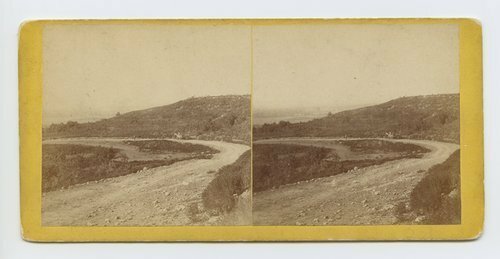 This is a stereograph showing Amphitheatre Road, Leavenworth, Leavenworth County, Kansas. In the background is a man with a wagon. It is from Alexander Gardner's series, Across the Continent on the Union Pacific Railway, Eastern Division. View on Amphitheatre Road, Leavenworth, Kansas. 309 miles west of St. Louis, Mo.